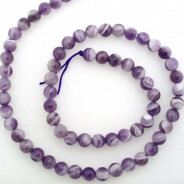 A-Grade Amethyst stone Round 6mm (~66pce Strand) - 40 cm /16'" Strand. 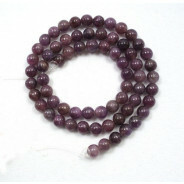 A-Grade Amethyst stone Round 6mm (66pce Strand) - 40 cm /16'" Strand. Also known as “Bishop’s Stone”. Name comes from Greek “a methustos” - not to intoxicate and Ancient Greeks made drinking vessels from Amethyst in the belief it would prevent drunkenness. 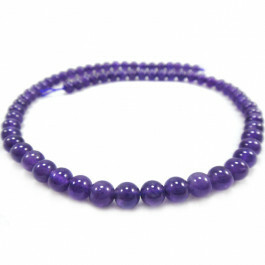 Ancient Egyptians wore Amethyst as a protective stone and beads of Amethyst have been found in Anglo Saxon graves in England. 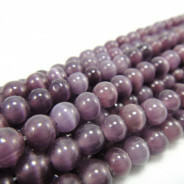 Believed to be a meditative and calming stone, working in the emotional, spiritual and physical planes to provide calm, balance, patience and peace.